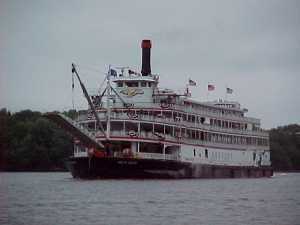 -----We expected to see steamboats on our cruises down the Ohio and Mississippi Rivers. However, ignorant as we were about the California Delta, we were fascinated to see steam boats were here. 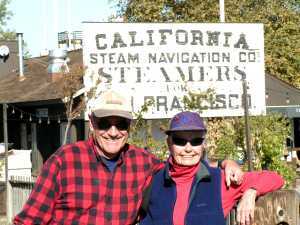 We quickly learned of the importance of steamers to the history of California. -----In 1847, just in time for the Gold Rush, the first steamboat arrived in the Delta. The 37-foot Sitka was assembled from pieces carried to San Francisco on a Russian bark. In November, this little side wheeler thrashed through the Delta, up the Sacramento River, to the town of New Helvetia. The trip was hardly faster than canoes, since it took six days and seven hours, but it was achieved with steam, not human, power. -----Two years later, the Senator began three trips a week between San Francisco and Sacramento, carrying 300 passengers and 300 tons of freight. There were six steamboats plying that route in 1853. Ironically, some of the men they transported toward the gold fields were soon sluicing banks of mud and gravel with huge hydraulic 'cannons' of high pressure water, freeing detrital gold from the ancient river sediment. The mass of muddy debris washed down the creeks and rivers. The floods of 1875 and 1878 buried the Delta under a pile of mud, destroying fishing, agriculture, water supplies, and steam boating. Many depths in the sloughs were halved before hydraulic mining was finally outlawed in 1884. -----At the height of the steam epoch, there were perhaps 300 steamboats plying the Delta. Only one is still operating today, and we passed her on the Mississippi River last fall - the Delta Queen. She and the Delta King were built in Stockton in 1927, near the end of the era. The Delta King, refurbished, has been turned into a restaurant and hotel, tied off permanently to the wharf at Old Sacramento. 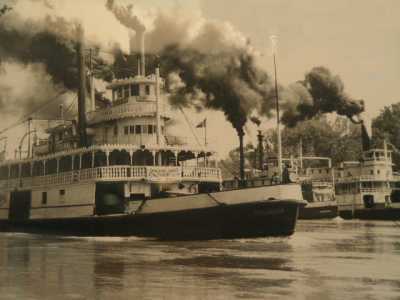 -----Steam boating in the west was akin to that we learned cruising on the Ohio and Mississippi - explosions, deaths, races, huge profits, price wars, collisions, and wrecks on snags. We are writing this tale, tucked into Halcyon in Delta Marina in Rio Vista. Rain is pounding on the roof and night has fallen. Ninety-eight years ago, on a similar fall evening, the 248-foot steamboat Yosemite was leaving docks a short distance north of ours. Suddenly her boilers exploded in a blast of steam. Forty-five people died. The steamer Washoe exploded, at almost the same location a year earlier, killing 16 passengers. Steam travel has hazardous. ----- However, this was the mode of choice. The Chrysopolis, nicknamed by her aficionados, Chrissie, was a luxurious steamboat. She carried 1,000 passengers from Sacramento to San Francisco in the record time of a little over 5 hours. -----There were also hundreds of little paddleboats hauling freight and small numbers of people into and out of every slough and creek in the Delta. Sometimes the water was so shallow on those backwater voyages that passengers, armed with shovels, waded into the streams to dig boats off the shoals. 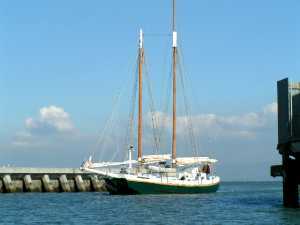 -----Sail-powered scow schooners, like the Alma, now a National Park Service vessel, were slower but less expensive to operate than steamships and many serviced the farms and farmers of the Delta. -----Railroads out-competed riverboats on the eastern rivers and river travel ended abruptly in financial ruin. In the Delta, railroads and steamboats were often owned by the same companies and augmented each other. It was refrigerated trucks that defeated commercial river traffic and short line railroads in the Delta. They carry agricultural produce from farms to towns with much less expense. 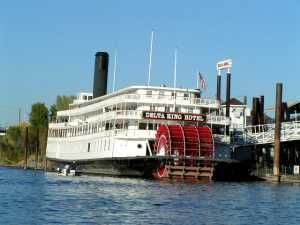 The Delta King, last of its kind on the Delta, cruises no more.